We live in a global economy. Steel from China and plastic from India are put together in Arizona to make tools sold all across America. California grows grapes, but the ones you find in the local grocery store were likely imported from Chile. Items from around the world are available at the mom-and-pop store down the street. Despite globalization, given the choice, most Americans say they prefer buying domestically made goods, according to Consumer Reports. Good old-fashioned patriotism motivates some people to buy as many American-made products as possible. Beyond that, more and more Americans love the idea of knowing and supporting the person behind the products they purchase. After all, the “Buy Local” movement is really just a “Buy American” campaign on a smaller scale. The product is all or virtually all made in the United States, which include the 50 states, the District of Columbia and U.S. territories and possessions. Final assembly and processing of the product must occur within the U.S.
Manufacturers must have a “reasonable” basis for their claim to the label as well as evidence to support their belief. Never were there three more indefinite terms brought together than “negligible,” “virtually” and “reasonable.” The FTC, in its regulations, uses all three, and all are wide open to interpretation. 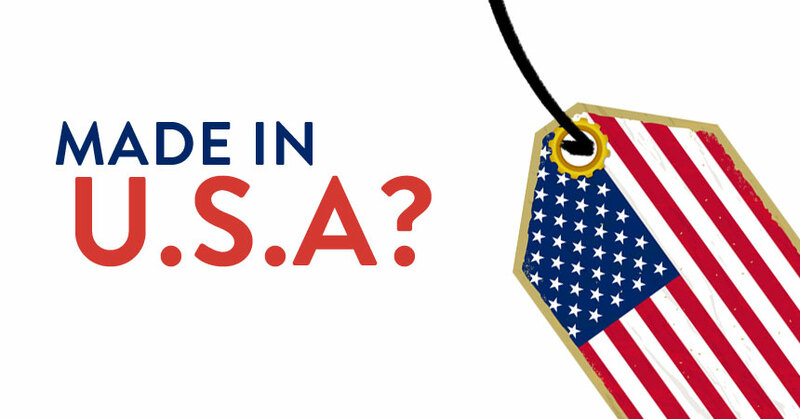 This leaves many consumers wondering if the “Made in the USA” label really means anything at all. Consumers may be seeing more labels that state something to the effect of “Made in the USA with imported components.” Perhaps labels such as that are a more realistic means of identifying a product’s origins. Specifically, a label listing all components and separating out where the materials came from, where components were manufactured and where the item’s final assembly occurred would cover all the bases, but such labels would also be too unwieldy to implement for most manufacturers. Nobody wants to try to sew a novel into a shirt, and nobody wants to wear a shirt with 12 labels. Nonetheless, just imagine the appeal of products with a triple certification of being sourced, manufactured and assembled in the USA. Federal regulations are one thing. Reviewing items to verify their USA claims is an entirely different undertaking. Undoubtedly, numerous items on the market claim to be made here but, in reality, were not. The FTC hears many cases on Made in America issues. E.K. Ekcessories, Inc., a manufacturer of outdoor goods and other accessories, labeled products as “Truly Made in the USA” despite the fact that their products contained substantial amounts of foreign-made items. The company agreed to drop American-made claims after the FTC brought a case against it.3 Even Stanley Tools, an American mainstay, conflicted with Made in America requirements on at least one of its products. Those looking for verifiably American products have a tough job facing them. First, there are the rather convoluted FTC rulings on how to label USA products. The result is that most determinations rely heavily on particular and specific circumstances within each case. One of the first steps in buying all American is realizing that just because an item has “America” or “USA” in its name or on its label does not mean it was made here. If a product’s origin claims seem suspect, do a quick Internet search on the company. Another idea suggested by Consumer Reports is consulting a list of products made domestically, such as the American-Made Product Directory or Made in USA Forever. The possibility of any consumer going completely all American in their purchasing is quite low. Unless you grow your own food and cotton, raise your own cows, sheep and chicken and forge your own tools – in other words, live in a completely self-sustaining, off-the-grid manner – not buying any foreign-made goods may prove impossible. In reality, there are few products that are unequivocally all American. "Complying with the Made in USA Standard." Complying with the Made in USA Standard. Bureau of Consumer Protection, Dec. 1998. Web. 10 Dec. 2014. <http://www.business.ftc.gov/documents/bus03-complying-made-usa-standard>.